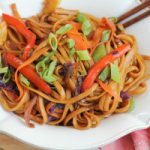 Quick and Easy Vegetable Lo Mein! Make one of your favorite Chinese food take-out dishes at home, in under 30 minutes! It’s so good and perfect for a weeknight dinner! Noodles are definitely a staple at my house. My kids love pasta and Asian noodles are one of their favorites. Because of this, Lo Mein was one of the first dishes I learned how to make. I would play around with sauce ingredients and vary what I put inside. Sometimes with beef or chicken and sometimes keeping it all vegetables. Chinese stir fry, fried rice, beef with broccoli, shrimp with white sauce and, of course, lo mein are some of our favorites. If you haven’t tried making Chinese food at home, you really need to! You’re going to be amazed at how easy it really is. I believe the key to great Chinese food at home is using fresh, quality ingredients and making sure you have the right cooking essentials. MAKE-AHEAD Cook the pasta noodles and chop up all of the veggies the night before and keep in the refrigerator. This way, everything will be prepped and ready to go for dinner after a busy day! Vegans should read the labels at the Asian market and should purchase a vegetarian oyster sauce. Using a large sauté pan or skillet, heat your oil over medium-high heat. After a minute or two, add the onions and sauté for a few minutes until slightly softened. Add in the zucchini, summer squash if using, snap peas, shiitake mushrooms and minced garlic and sauté for a few minutes. Season with salt and pepper and continue sautéing for a few minutes longer until the vegetables are tender but not too soft. Add in the bell peppers, red cabbage and carrots and sauté for 2 to 3 more minutes. Drizzle in the sesame oil and mix together. Add the cooked linguine noodles into the pan along with the mushroom broth, soy sauce, hoisin sauce and oyster sauce. Toss together for a few minutes, or until the noodles are well coated and heated through. Taste and adjust any ingredients as needed. Garnish with diced green onions and serve immediately. Enjoy! Visit The Kitchenthusiast to read my blog post. Disclosure: This is a sponsored post and is in conjunction with my partnership with KitchenAid and The Kitchenthusiast. All opinions expressed here, as always, are 100% my own. Thank you for supporting me in partnering with the brands that I love. Mmmm…I love lo mein but I rarely make it. I have no idea why that is! This looks delicious, Alice. According to my mom, Chinese food is the easiest thing to cook because she uses the same four ingredients as the base for all her dishes: salt, sugar, soy sauce and oil. That’s it, lol. No matter how many times I try to recreate the recipes of my mom and my mother-in-law, it’s never as good. Hopefully I can try this recipe and it’ll be as tasty as your photos look! Nancy, you have to make this. . I think you and Tony will love it. . and yes, your mom is right. . cooking Chinese food at home is a lot easier than you think! I like the use of pasta, with the asian flavours you have here. My brother made something similar once and it had a really great texture. Veggies are always much more fun with delicious noodles too! Even for big kids like me! Thank you, Alice! yeah some might think it’s odd to use linguine noodles here but I love it. . . slurp!! 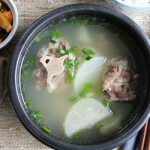 Hi just wondering do we have to add the mushroom broth in this recipe? 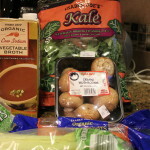 Hi Chelsea, if you don’t add mushroom broth, I would add vegetable stock . . it needs something in my opinion. Hope you try it! I was trying to meal prep something like this for work last week and I got overwhelmed and stopped. I think this is easy enough for me to recreate for the week! 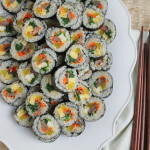 I am craving this so badly right now Alice, it looks incredible!! Thanks so much, Ashley!! Hope you like it and give it a try! Girl this looks delicious! And you said quick? What? Definitely need to try this! haha, yes! You need to try this! Super easy weeknight meal! Recipes that contain the words quick and easy are my absolute favorite!!! I can’t wait to hop on over and get the recipe. It looks fantastic! Thanks so much, Kathi! I’m with you . . quick and easy rocks! Thank you, Samina! I just added a “make-ahead” note: cook the pasta and chop all the veggies the night before. .. this way, everything is prepped and ready to go which will make for an even faster dinner! Yes, I totally need a “Chinese Food for Dummies” recipe! I’m scarred by too many greasy restaurant meals and am intimidated to make my own–I can’t wait to give this one a try! Thanks so much Elizabeth! yes, I hear you on the greasy meals. . this is why I make mine at home! I hope you do give the recipe a try! Happy Friday! Thanks so much, Kelly!! Linguine noodles are easy and so delicious, right?! I can imagine how much your children love this! I taught myself to cook Chinese food when I was in my late twenties. My husband loved that stage. He would go to work with Chinese food that was the envy of the office guys. I’m printing this recipe and making it tonight. My goodness, if it tastes half as good as it looks, I’ll be in heaven! Where can I find this wok?? 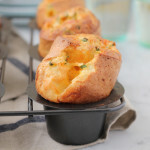 I don’t know why I can’t include the entire clickable link. . anyway it’s from Staub. . on sale now at Williams Sonoma! Looks so yummy! I love all your content!! All your recipes always look amazing!! Can you please tell me what brand vegetarian Chinese oyster sauce you use? All of the oyster sauces I have found are not vegetarian. If you could provide a picture too that would be AMAZING! Thank you so much!! Thank you so much you are awesome! Definitely making this recipe! I am entering for the wok! Entering to win the wok! Yum! I would eat this for breakfast right now if I could! Extra entry for the staub wok! I’d love to win the wok! Love lo mein and would love to win a wok!!!! Would love to try this recipe in the wok from the giveaway! I watch you everyday! Love all the recipes! This recipe is in the regular rotation at my house! The kids love it because of the noodles, my husband loves it, and I love that everyone is getting a healthy dose of veggies!!! I’d love the wok! Thanks Alice for the chance! So I have to admit I mostly came here for the giveaway… but, looking over this recipe it sounds so freaking good. I haven’t had lo mein in so long and now after seeing this I might just make it later this week. Haha. Thanks for the inspiration! can’t wait to make this looks soo good! In love with this wok! And the recipe! This recipe looks amazing! Would love to win this wok! Thanks for the wok giveaway chance Alice! Love your food! Thank you so much for the giveaway! Love all your food and your post. I just entered to win this on your IG page! Please pick me!!! I love cooking and would love to use this to cook authentic Asian food! I might actually be able to get my kiddos to eat their veggies! I’d love to win the wok! Oh I need a good wok! Been searching for one for ages! This would be wonderful to win!! Thank you so much for making my life so much easier every night with these simple recipes!!! Excited to try this recipe! All I need is a Wok!! We eat stir fry and fried rice all the time! 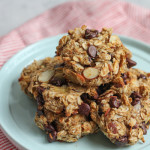 We have recently been eating more plant based do this recipe has been great! I would like to enter the wok giveaway to make this delicious food! This is so awesome! Thank you for the opportunity to win one, and thank you for sharing your delicious recipes! I need a new wok so i can try this recipe! I’m here for the wok! I’m a huge fan of stir fry, pad thai, fried rice and phat bai horapha and would love to be able to cook those dishes in a wok. 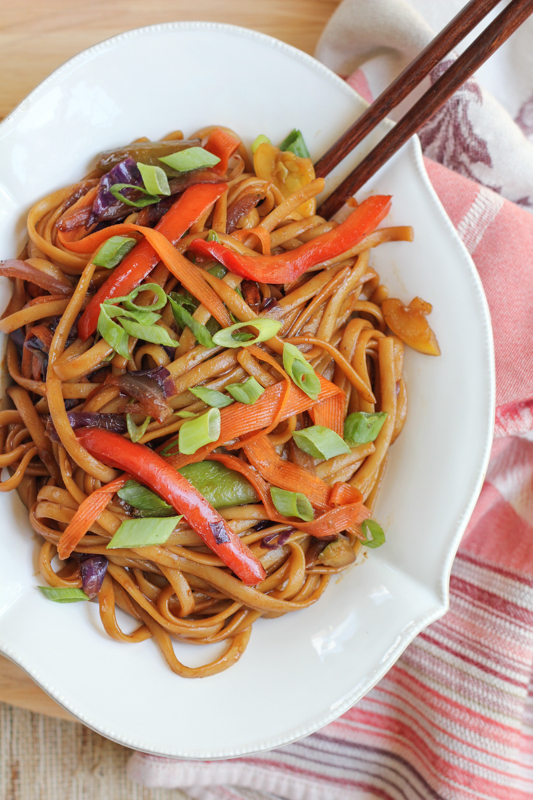 Cannot wait to try your veggie lo mein! Hoping I can win this win, in order to do justice to this recipe. This looks so yummy! Definitely going to have to try this recipe. My husband and I love cooking Asian meals together. Ahhhh!!! Love all your recipes and must win the Wok giveaway!!! Girl Look so delicious ! I’m going to make it is pack with all delicious vegetables ! OMG this Wok would make weeknight meals so fast and easy! I love the way that Wok’s can cook things at such high heat so you can develop color and flavor while maintaining the crunch of your veggies. 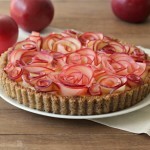 Can’t wait to make this soon!! Would be even more fun in that awesome wok!! I’m not good cooking but I need to try this. Always been wanting a cast iron wok and if I win this, first thing I want to cook in it is your vegetable lo mein! Great giveaway, I would like to enter on here as well as instgram. Oh how I need this wok! This looks so good! Excited for the wok giveaway! My daughter loves this recipe too! Need to make this Lo Mein in This Wok!! YES! The full recipe. 🤔Now try it in a wok instead of regular pan. Thanks for the fresh ideas. Entering for the wok! This recipe looks sooo good! Thank you for making Asian cuisine so approachable for those of us who may be intimidated by making it at home. I learn a lot from your videos and posts. Awesome giveaway, we ❤ lo mein at my house! In your opinion, would whole wheat pasta comprise the flavors here? Looks delicious ! Will be trying this soon! This looks delicious! Love your recipes! Would love to win the wok! And will be making this dish ASAP. Looks so delicious! So excited to make this. I need this WOK in my life!!! Love all your recipes and videos! I make this recipe and similar ones to it all the time because of how easy it is for a meat free meal! Entering to win the wok! A wok happens be one of the few things I don’t have in my kitchen but need. Would be amazing to win one! I need to make this like tonight!! Looks delicious! Would love to win this wok and make this dish! Wok giveaway to make this beautiful dish! Yay! I’ve never tried making lo me in at home. I’m sure this wok would definitely inspire me!! I love your giveaways and videos!! You rock! Would love to try this recipe in the cast iron wok!!! This recipe looks so good and healthy!! I really want to try it next week! I love that you use linguini. I would have never thought to but it turns out SO good!! What a beautiful wok! Hope I win lol thank you for all your delicious recipes!! Would love to be entered for the wok! Hoping to win the wok! Entering to win the WOK! How did I not know a cast iron wok even existed??!! Looks delicious! Entering for the wok! Having this wok would make my life so much easier! I make your veggie lo mein pretty often and it’s delicious! Keep up the great work Ms.Alice! I made this Alice and it was a hit! I do a lot of stir frying but had never used red cabbage before. It was great and added yet another color to a beautiful dish. Love this! Any good sub for the hoisini sauce? Entering to win this beautiful wok! Entering for the WOK (ahhhhh that wok 😍) giveaway!!! My whole family loves lo mein. (there are 9 of us) and I make fried rice all the time so this would be great because I do not have a wok. I want to try this so bad! I love your recipes and fun videos! They are always so nice to watch with my daughter. Wow, would LOVE to make this in the cast iron wok! 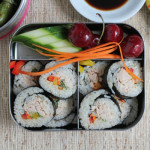 I’m always looking for new recipes to make and love trying out different Asian foods. This looks delicious! I am going to make this for sure! My mother-in-law’s wok from the 70s that she gave me died a long time ago 😂 Entering for a chance at the cast iron wok from your giveaway! I make this at least once a week! Highly recommend! This looks soooooo good!!!!!! Thank you!! I just made this recipe last night and it was so delicious! I loved all the veggies in it. And my six-year-old, who didn’t want to try it, ended up eating his whole plate after finally taking a bite. Love this recipe and would love it even more using the wok! LOVE this! And the wok! I just made this with whatever veggies I had in my fridge. 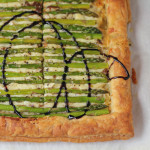 Asparagus broccoli & green beans. It was so delicious and EASY! I would love to win that WOK! 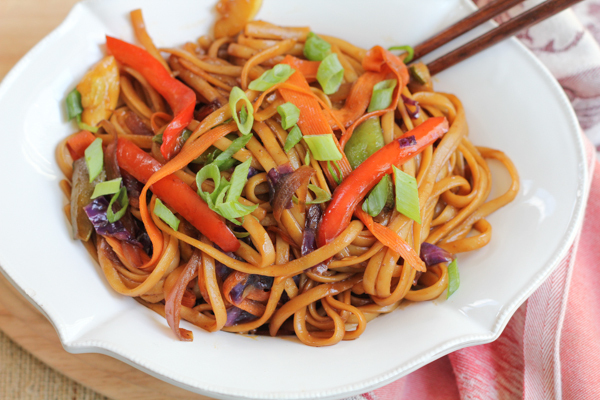 Love this lo mein….and would ❤️ the wok! I’m here for the wok! Yes!! I need this wok in my life. Trying to make one pot meals for a family of 8 who loves Asian foods. Yay for big ol pots and pans! 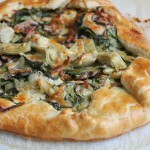 Definitely going to make this next week for Meatless Monday! 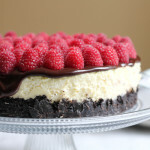 I’m entering the giveaway and I hope I win so I can make this delicious recipe! I’m entering the wok giveaway. Thanks for doing the giveaways! Perfect recipe to make to cut back on take out! I love this wok ! Chose this recipe since the little one loves noodles. Had some left over and took it to work for my coworkers and they loved it. Quick and easy! entering for the wok! I never thought of using regular pasta for Asian dishes.. def something I will try! I am going to have to try this! Would love a wok to cook it it! This recipe looks great, I can’t wait to give it a try! I have some mushrooms in the fridge I have no idea what to do with, so is the mushroom broth as simple as it sounds? Hi Reem! You can buy mushroom broth from the grocery store. . it’s with the chicken and beef stock. . or, you can use vegetable stock if you can’t find it! Can not wait to try this! I could eat Asian food every day! Confession: I’ve never owned a wok and I want it! Yum! 🥢One of the things I always looked forward to growing up was when my mom would have the whole family over and make Chinese/Asian flavored dishes. It’s been a too long since we’ve done that, but now I’m old enough to help! Ha. I can bring this veggie lo Mein. Entering the giveaway also. I do not own a wok and have always wanted one to cook my Asian dishes!! This looks so good! I can’t wait to see how it comes out. Now all I need is a great wok!! I’m going to make this on the weekend! Looks delicious and healthy! Thanks for sharing the receipe. This. Looks. AMAZING!!! 🙌🏼 Can’t wait to slurp up those saucy noodles! Entering for the Wok! Absolutely love your ideas and recipes, thank you for sharing. Entering for the wok giveaway! I’m definitely going to try this, however I’ll use vegetable broth since i kept plenty on hand. Hopefully it tastes just as good as yours looks! This would be a wonderful addition to my kitchen!! This looks so yummy! Hard to beat quick and easy 😂 I’m also entering for the wok! I loved this wok since the moment I saw it! If you haven’t tried this, MAKE YOU SOME!!! It is delicious and a recipe I use weekly. So good!!! 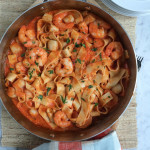 Love your recipes and account! Here for the Wok! My husband would flip if I win it! Can’t wait to try this, hopefully with the giveaway wok! I’m entering for the wok giveaway! 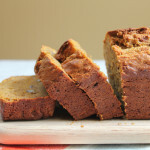 Thank you once more for sharing you delicious recipes! Extra entry to win this wok! I love this recipe! I wasn’t sure how it would come out with whole wheat pasta noodles but it was so delicious everyone in the family & kids enjoyed it that there wasn’t any leftovers! This looks incredible! Thank you! Entering for the Wok! Yum! Would this still work with a gluten free noodle? I’m looking for good gluten free alternatives. Entering for the wok! This looks amazing! This one is definitely on the “to-make” list!! So good! I would love to win the wok! Entering for the wok! She’s beautiful !! Entering to win the wok!! Can’t wait to try this! Entering for the wok! Looks amazing!! Woks make being vegetarian so much easier. Everything tastes better when made in a wok!! Thank you for giving us the chance to win one!